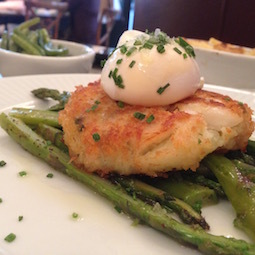 This fish cake recipe is quite luxurious - use smoked haddock and top it with a poached egg (click link for instructions on how to poach an egg) and serve over a bed of asparagus. 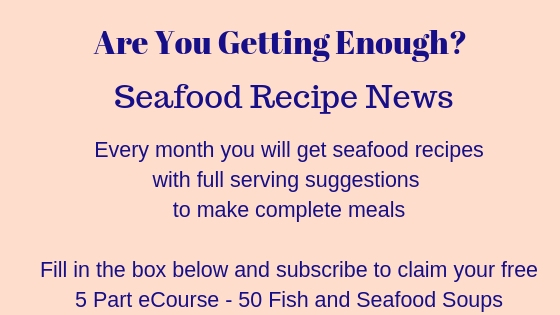 You make seasoned flour by putting a couple of tablespoons on a plate, then adding pepper (salt if you're using plain wet fish, not smoked fish) and maybe some dill or other herb - dried is fine and you'll need about half to one teaspoon depending on how strongly herbed you want the flour. Mix it all together evenly then use this flour to dip the fishcakes in before you put them in the fridge to chill and firm up prior to cooking. 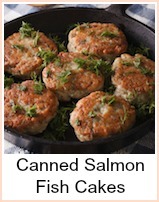 Don't make the mistake of not allowing time to 'chill' the fish cakes. If you don't they will more than likely fall apart when you go to turn them over. 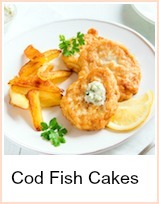 You can get round this by using an extra large fish slice and then turning them *really* carefully. You could also bake them in the oven. If the mixture is sloppy because you've added too much milk, then you will need to do something to rescue it. Add a spoon or two of plain flour to stiffen the mixture. Taste the mixture *before* you add the raw egg. Boil the potatoes in water for about 20 minutes (you could use leftovers)until soft. Meanwhile poach the smoked haddock in the milk and butter with a twist of black pepper - about 5 minutes, until it flakes. Separate the fish from the skin and bones. Break it into pieces. Use as much of the milk and butter mixture as you need to mash the potatoes until smooth - don't make them too 'sloppy'. Mix in the smoked haddock. Add the parsley and taste the mixture - season if necessary, but it probably won't be. Divide into 8 and shape the mix into balls then flatten them. Coat in seasoned flour and leave to firm up in the fridge for about 30 minutes. At this point, you can either fry them about 5 minutes each side or bake in an oven - Gas Mark 5, 350F or 190C for about 30 minutes until heated through. Poach 4 eggs whilst you're cooking the fish cakes. 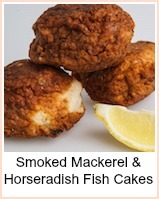 I love the saltiness of the smoked fish, but you could use a mixture of fish if you prefer or just plain cod or haddock. Adjust the seasoning BEFORE you add the egg.